A small parakeet, the Bourke's parrot can reach up to 9 inches in length. 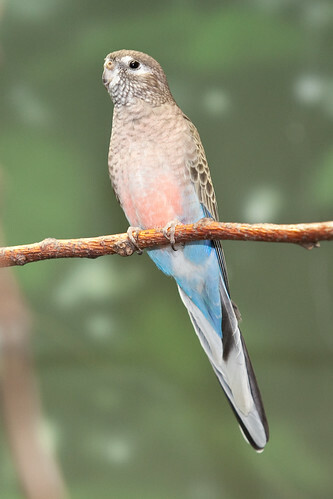 The species has a pink chest and back with blue and gray wings and tail feathers. Males can be distinguished from females by their larger size as well as a colored band that extends over the face. Bourke's parrots are considered a species of least concern by the International Union for Conservation of Nature. Bourke's parrots forage on the ground for grasses and seeds. They are most active feeding at dusk and dawn. The species typically lives in groups of four-six individuals, although they can gather in flocks as large as 100 birds. 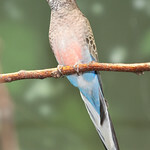 Breeding pairs are monogamous, with the male guarding the nesting area and feeding the female as she incubates the eggs. Nesting occurs in unlined tree holes. The Bourke's parrot's feathers help the species blend in with the reddish soil of its home.